Viewing topic "loading wav files"
It was said in this forum that XS has a certain processing time for sample loading from usb or ethernet so that no maximum transfer speed of the medium is achieved. This processing would involve sample conversion delay or similar. Now I wonder if this is only related with proprietary XS formats so that maybe .wav libraries (no processing needed) load much faster. 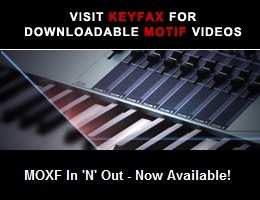 The Motif XS can access .wav files with no processing, immediately. There is no load time - it is real-time access. Highlight the .wav file which can be located on a USB drive connected to the TO DEVICE port or if connected via Ethernet it can be on your computer in a shared folder or on a shared drive. However, if you a loading a .wav to the Motif XS’ RAM (DIMMs) it must be ‘processed’ (converted) so that Motif XS parameters are applied to it (VOICE parameters, etc). Otherwise you have not way to trigger it. I have a .wav file that I am attempting to load and SAVE on my XS7… I can (as you mentioned above) play it just fine, but when I try to follow the steps to save it to a user profile, it does not give me the option to save, or it only shows the directory, not the file itself. What am I doing wrong?! I know there must be a simple way to do this, and I must be missing something. Thanks for your help. Terminology - getting it straight will only help you understand what you must be missing. You are saying “save it to a user profile” - what you probably want to do first, is LOAD the .wav into a VOICE. EDIT that VOICE and then STORE it to the appropriate USER VOICE location. Once you have loaded the .wav to a Motif XS VOICE, and once you have named and STORED that VOICE, then you can SAVE the data to file. It is important to get this terminology down so that it clear what is happening. Samples are loaded into volatile RAM… The VOICE parameters address that sample. You “store” the Voice parameters in a USER VOICE. Only STORED information gets “saved” to a file. remember user samples disappear when the power is turned off. The are only loaded temporarily into RAM (Random Access Memory) and just like anything that exists in RAM on your computer - it must be restored each time you want to use it. The VOICE parameters remain, it is the user sample that is volatile and that disappears when power is removed. So we have to ask what is the user sample you are working with, because there are different scenarios for different types of samples. For example, if the sample is part of a musical instrument sound that you are going to play (chromatically) as a normal VOICE - like a “flute” or a “saxophone”, etc. there is one procedure. But if the user sample is a percussion sound that you want to play as part of a drum kit - there is a different procedure. And if the user sample is an audio clip… like a audio loop or like 10 seconds of sound effects (perhaps a fire engine approaching and going past, or vocal clip of someone singing or speaking) there is yet a different procedure. Samples can be loaded into the sequencer (what is called a ”User Sample Voice”) by targeting a PART 1-16 and a specific ‘key’. Okay, yes, you’re right I need to get the terminology accurate in order to figure out what I need to do. So, yes, I am trying to STORE a SFX clip, so that I can then assign it to an element in a certain performance. The SFX clip is .wav, and I have it on a usb device. If I can get it to the “store” action, then I know what to do, it is in getting there that I am getting lost. I thought I would have to store it as a voice? But you mentioned something else for a SFX clip. Yes, I did. There is no one way to proceed but depending on the length of the clip, you may find it convenient to place long audio samples in a User Drum Kit Voice. Here’s why: As you know samples are audio but they are audio that is always triggered by a NOTE-ON event (this is what separates them from the type of audio you would find playing back from a hard disk or from tape or some other device). Not only is the note-on event important but the duration of the event is critical - because samples, as you know, are started and ended by action of the keys. Of course, where you choice to load the data is your own preference. And will be determined by how you want to use the sound. While Normal Voices have AEGs (Ampitude Envelope Generators) that can make a sound last a fairly long time. Drum Voices can be made to sound indefinitely - the envelope can actually be set to ‘hold’ - and the sound will continue forever (until electricity is interrupted or you send a command to tell it to stop). This makes a Drum Kit perhaps the best place to put audio loops and/or longer audio clips. Within a DRUM VOICE you will find that each of the 73 KEYS available, can house a different multi-sample. (Multiple samples can be stacked to trigger from specific velopcity ranges) - each KEY is a different instrument, and yet you can stack multiple samples vertically on that single key. Because Drum Kits (and drummers) are different you will find several useful parameters: like ALTERNATE GROUPS… where one note in a Group will stop all other notes assigned the same Group (so you can turn off a sound by striking any other key assigned to the same group). This is how the Closed Hihat stops the Open Hihat, and how the Mute Triangle stops the Open Triangle… You can use a “silent note” or another audio clip to stop the current audio clip. If you have any questions - post back here. Well, it seems the drum voice might be the way to go. This is about 15 sec (if even that). of ‘radio changing stations’ sfx that I want to play at the beginning of one particular song. I want it to just play once-per-time I play the song...not continuously however. If the XS had that particular sfx I would just use that, but it doesn’t. I have the rest of this song set up to play live in the performance mode, but I’d like to add that at the beginning, and then turn that fader down and not use it the rest of the song. Can I load a “drum voice” into the performance mode and use it that way, if I stored this sfx as a drum voice? Can I load a “drum voice” into the performance mode and use it that way, if I stored this sfx as a drum voice? Yes. I referenced the tutorial because that is precisely what is done. The paragraph called “Using Audio Clips in a PERFORMANCE” is particularly on point… but the entire exercise will get you to a point where (hopefully) you get comfortable with creating what you need within the Motif XS. Although it uses the Motif XS to create the audio clips (where you already have a sample of what you want) you will find most of the article pretty much on target for what you are trying to accomplish. By the way, the sound effect of a radio changing stations can actually be created within the Motif XS but if you already have the sample that works for you - then you might as well use it. Ok, but just out of curiousity---since you mentioned it---HOW does one go about creating that sfx in the Motif? When you’re loading a wave file into the motif, is there a max of size the wave file can be? because i have a file of 36mb and i want to put it underneath a key of the motif, but the message apears, can not recognize the file. If the instrument reports it cannot recognize the file - that is a literal message. If the file were too big it would report that the file were too big. The largest single file that can be loaded is 64MB (6 minutes and 20 seconds at 44.1kHz resolution). If the file is not 16-bit, the Motif-series will not recognize it. The wav file is adapted with qbase,so i think it is not 16-bit. What is “qbase”? Do you mean Cubase? If you are using Cubase, simply export the wave as a 16-bit/44.1kHz .wav - easy.